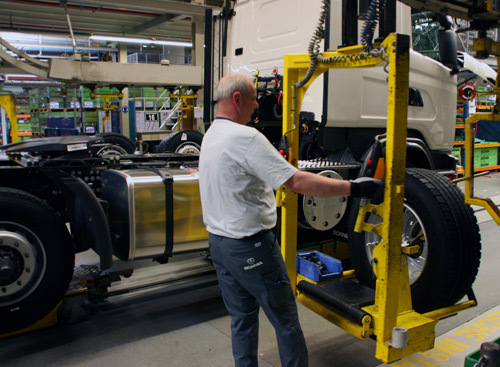 At Scania Zwolle Production, each year and per employee, 20 to 25 trucks are assembled. To stay ahead of the competition, the truck manufacturer raised its productivity with about 6% every year in the past period, and they wish to continue to do so. Scania achieves this spectacular progress by constantly striving for the ideal process, in which all components flow seamlessly together to form complete trucks, without any waste and loss of time. The epitome of lean manufacturing! Scania takes small steps in that direction each day, and this is only possible when all approximately 1300 employees do their part. To that end, having self-managed teams turned out to be not enough. The workforce also needs resources, structure and support. Therefore Scania carried through two changes. First, the formation of a 5 +1 organization. One example: to each production team of five people, one extra person in the role of team leader and libero was added. This so-called Andon steps in when needed and he or she also keeps up which problems occur. The second change in the organization was the introduction of Kaizen team leaders. These people are exempted from their normal work for a period of two years, to be able to lead improvement projects. After 16 years of consistently applying of Lean manufacturing, engines, chassis beams, screws and plastic parts flow just-in-time through the network of Scania’s factories. Only when components are ordered these are made, just-in-sequence. You get the feeling that parts are drawn to the assembly lines by a mysterious magnet. There they merge into trucks, in peace and quiet. Appearances are deceiving, though. The closer you come to the final product, the more complex the logistics become. This is because the probability increases that one particular component does not arrive on time. And even when it does, there can be something wrong with it! 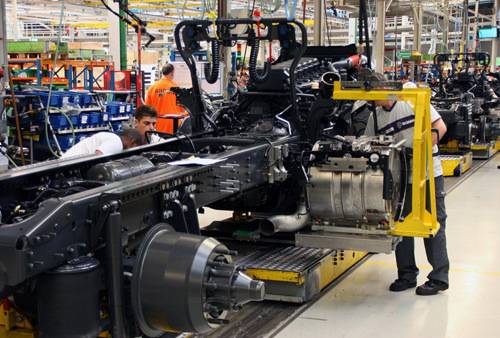 Engines, chassis beams, screws and plastic parts flow through the Lean network of Scania. At the assembly lines, here in Zwolle (NL), these components come together. 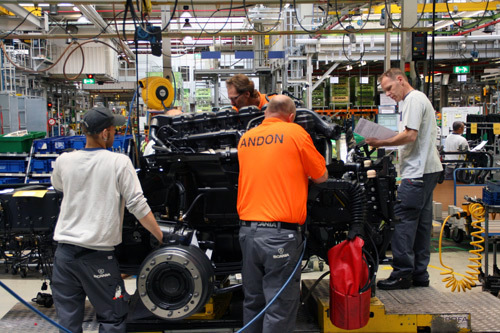 It is not for nothing that visiting the assembly line of Scania in Zwolle in the Netherlands is so popular. They even have a tourist train, to ride large numbers of visitors through the factory. Fortunately, I can freely wander around, while Kaizen team leader Wim Bijvang explains to me how the trucks are assembled. In addition, several production workers enthusiastically answer my questions. The factory is well organized and clean, which makes you feel safe. Only now and then we have to watch out for passing fork-lift trucks. There are two U-shaped assembly routes. "We use only the outer line," says Bijvang. "It was designed for the construction of 100 trucks per day. However, we are working so efficient nowadays, that 142 is possible." At the moment when I visited the factory, 120 trucks roll of the rails each day. "That's exact the amount we need to fulfill current demand. Every truck you see, is ordered by a customer." While the trucks are assembled, they move from pitstop to pitstop. 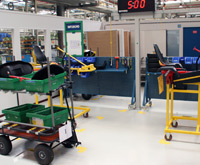 During each stop, three to five production workers each carry out a "standard", this is a standard procedure to perform a given assembly task. Currently, to complete their activities the employees have 387 seconds. This is the “takt time” or the duration of each pit stop. Intriguing is that every activity seems so simple and obvious. However, there are dozens of pit stops, and hundreds of standard tasks must be completed before a truck is ready. To make this possible, all materials must arrive on time, otherwise the whole line stops. Take also into account that this is not mass production: trucks in various designs and colors alternate, in sequence of the orders. And it gets even more complex: even the takt time is not constant! 387 seconds per pit stop is just short enough to meet the current demand of 120 trucks per day. However, when the demand increases, an even shorter takt time is set, so that the assembly line moves quicker. At Scania, this does not mean that the workers have to work harder. Instead, the way the standard tasks are divided is then reevaluated. By making the tasks smaller in size and bigger in number, it is possible to complete the tasks within the new, shorter, takt time. In this case more people are needed along the assembly line, but in many other cases the work can be done with fewer employees. Why? Because the people constantly find ways to execute “standards” faster, without changing the work content. Also then the division of the work is reevaluated, and in this case it often turns out that one separate task can disappear. This means one worker less along the assembly line. In the past 16 years Scania took a lot of these small improvement steps, which together explain the large productivity gain! The assembly process starts with two steel beams, that arrive by truck from Sweden. On that spot there is a door in the factory, which makes just-in-time delivery possible. After their arrival the beams are transported from pit stop to pit stop with a crane system. In several steps they become connected to form a chassis. "When this process is completed there is a buffer, because some customers want their chassis painted in a special color. If so, their chassis is temporarily taken out of the workstream. However, this does not mean that the assembly line stops. The work continues with a chassis which does not have to be painted, because that customer has ordered one of the standard colors.” The result is that orders overtake eachother. "In order to ensure that the work within each pit stop can be completed on time, in some cases work is prepared within extra work stations. "There you see an example: those cables are hung up on a cart, ready to pick”, points Bijvang (see the photo on the left). The axes are prepared on a separate ‘lean’ assembly line which feeds the main stream. After the axes are added we arrive at the pitstop where the motor and the driving system are placed. At this point something special happens: Someone pulls a so-called Andon cord, as a sign that he has a problem! This does not immediately lead to a stop of the assembly line. Instead, a man in a striking orange shirt with the name 'Andon' on his back, rushes to assistance. Very smart, how Scania separates the execution of standard tasks and problem-solving activities! When the driving system is added, a problem occurs. Immediately an 'Andon' (team leader) steps in. As a result, the work can still be finished within the takt time. Next, I witness one of the most spectacular pit stops: A cabin – ready-to-use delivered from Sweden - settles on the base. Again it strikes me how quiet everything goes. Nowhere I see people running their legs off, or with sweat on their foreheads. “Is this the most problematic step?”, I ask “The line is perfectly in balance”, replies Bijvang. ”However, some tasks are indeed tougher than others. We measure this, because being Lean does not mean that we want to push our workers to their limits. On the contrary, we want this factory to be a healthy place to work”. The toughest task - classified as double red – is the one we see next: placing the wheels. The resemblance with a pit stop during a formula 1 race forces itself upon me even stronger than before. "Some bending and twisting is unavoidable to execute this task. Therefore at this station people only work during short intervals”. After the wheels are placed the trucks finally go to a test track - a kind of treadmil for trucks. When they pass the test they are ready to be delivered to the customer. However, in a small number of cases there are some remaining problems to be solved. These trucks are set aside. This is also done when a customer wants special additions, such as a refrigerator. A little later we meet Kees Luttik, head of the Scania Production System Office. "Many other companies call this their Lean office," says Luttik. "A couple of years ago, we switched to a 5 +1 organization. The Andon or team leader you just met is an example. We now have one team leader per five people, and one group leader per five teams." This meant investments in extra personnel. “Without spare capacity regarding equipment and people you cannot be lean. If you want to improve, but give your people no way to do that, then this will not work", stresses Luttik repeatedly. The assembly process in Zwolle is so complex that only someone with a deep knowledge of Lean manufacturing will understand the essence of it. In addition, it is far better to experience Lean then to see it. To that end, there is a shielded training facility in the center of the factory, with a real assembly line to make karts in six steps. How do you do that, involve 1300 people in your factory in improvement activities? "First, we let our production workers define their own standard operating procedures. You need these as reference points, after this you improve by adjusting the standards. Second, as a Lean manager it is important that you often visit the workplace. Go to your Gemba, to see if working conform the standards is successful. Finally, it is important that everyone understands how they can contribute to the improvement strategy during their daily work. Last year we aimed to raise the productivity with 6%. A goal like that should be translated – or cascaded - into objectives for workstations." The competition is ready to pounce. "We want to keep our lead. Therefore we continuously reduce our costs, by building trucks with fewer man-hours." One of these six Kaizen leaders is Wim Bijvang. “Kaizen team leaders are exempted from their normal work for two years, to lead improvement projects. Every four months someone enters and someone leaves the Kaizen leaders group. As a result you get an increasing number of experienced change managers working in your assembly line." 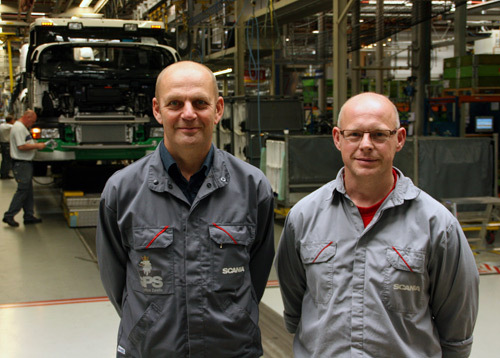 Kees Luttik (on the left), standing besides Wim Bijvang: "If you want real improvement, then you should provide resources, structure and support"
Being a Kaizen team leader, Bijvang is responsible for the continuous improvement of the part of the assembly line where the driving system is added. "It's my job to translate a company-wide goal such as 6% productivity improvement to tangible Kaizens or incremental improvement activities", he says. This process begins with a workshop, in which also Kees Luttik and various team and group leaders participate. The question arises whether you get much resistance when you, for the umpteenth time, ask to raise the productivity. "Sometimes you do”, responds Bijvang. "However, our goal is never to work harder, but to work more efficient. Therefore my first question is: What prevents us now to be 6% more productive?" Now, the importance of having standard procedures becomes clear. As a result, the answer to the question above is relatively simple! During the factory tour Bijvang showed me an improvement board, with a standard task divided into green, red and orange time bars. "What you saw is the result after filming that task several times. Green bars represent time when value is added, and red bars represent time when value is not added, because it is spend for example on activities like searching or walking. Orange bars stand for actions that we see as necessary, at least at this moment, but which also do not add things for which a customer is willing to pay". Time Registrations inspire to improve. Green bars represent value adding activities. All promising ideas which are put forward during the workshop, are added to a roadmap. "After this, our step-by-step plan is ready: it is clear on which Kaizens and in which order we are going to work during the next three months. However, we do not know in advance how much improvement will result from each improvement project. During the execution of each Kaizen, I help to solve problems and I suggest the use of appropriate Lean tools, like for example fishbone analysis”. Bijvang gives two examples of recently achieved improvements. 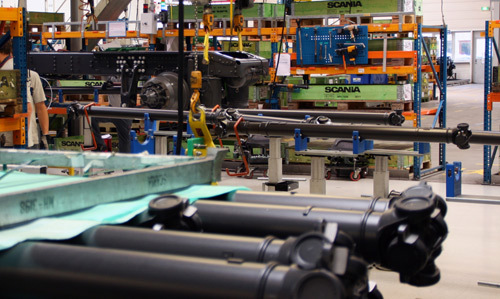 "Until recently we had a separate workstation to put link couplings ready for assembly. However, only 50% of trucks need these couplings. It turned out to be possible to combine the preparation of those couplings with the putting ready of the cardan axes on carts. As a result, one employee less is needed along the assembly line". Initially, there was much resistance towards that idea. "One of the production teams objected that they were too busy already. In such a case you should go and see why. Often, it turns out that it is possible to take things off their hands. In this case also films and data helped to demonstrate that combining the two stations was a feasible idea." In the two examples above, it was relatively easy to reap the fruits of working more efficient. However, in many other cases this is a complicated puzzle! "In general, when you can execute one standard task faster, this only becomes useful if you can accelerate other tasks too. This is because multiple assembly tasks are done during one pit stop. After improving several tasks you can redistribute the work to eliminate one or more separate tasks”. Scania is often praised for their high degree of ‘Lean-ness'. In my opinion the way they involve their employees in process improvement, as shown in this article, is however more important. 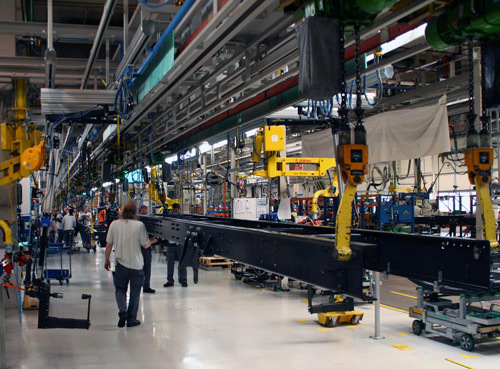 The principles Scania applies to that end are universally applicable, and that cannot be said about the visible manifestation of Lean in their factory. The physical part of their solution is limited to assembly lines within capital-intensive industries, in cases when there are a limited number of product variants. Lean cannot be copied, cases as described on this website should be seen as sources of inspiration. You should develop the right system for your business yourself, including an organizational structure for problem-solving. To do that you need a lot of patience and you will start a process that will never finish. At Scania they have been working on it for 16 years now, and they still get better each day! Some articles like this are (partly) hidden, for example because these were published very recently in a logistic specialist journal. Do you need help with the implementation of Lean?